Want to make your AR-15 even better? The only question is…where do you start? 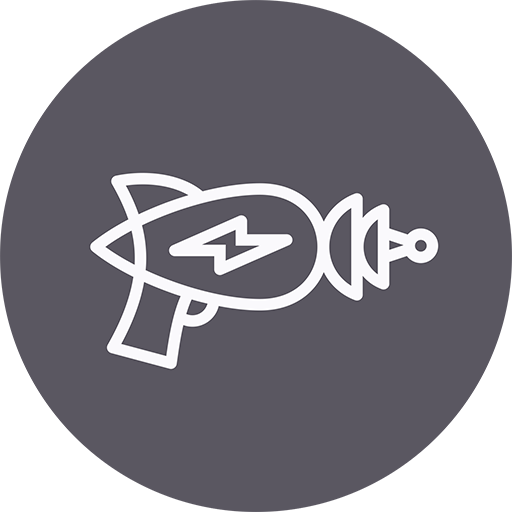 We would pick the trigger – a great trigger comes with a huge range of benefits for tactical, plinking, and competition reasons. There are a lot of great triggers on the market for the AR-15, we looked at the 13 Best AR-15 Triggers not too long ago. Two of our favorites though is the Timney Calvin Elite and the Timney Competition. We love these triggers so much, we even made a video review of them for your viewing pleasure! 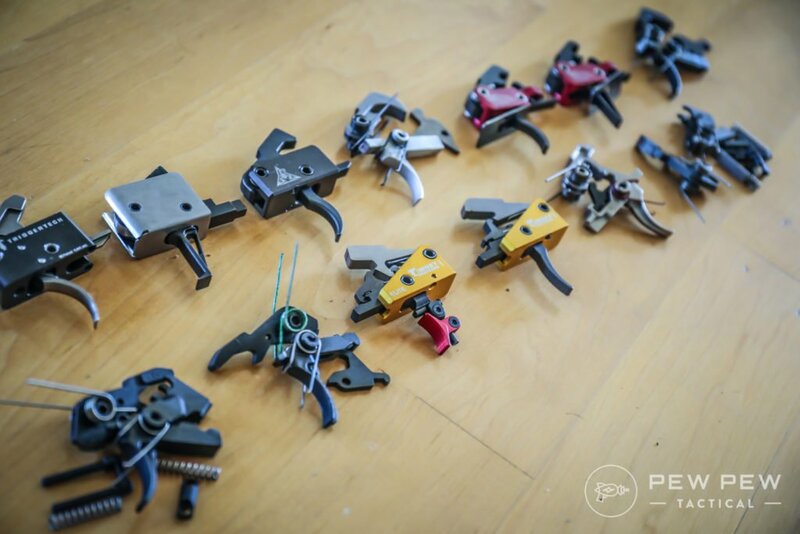 With all of the options on the market for awesome triggers, picking the right one for you can be, at times, daunting. While you can’t go wrong with any of our trigger recommendations, Timney stands out as being one of the largest and most established names in the business. 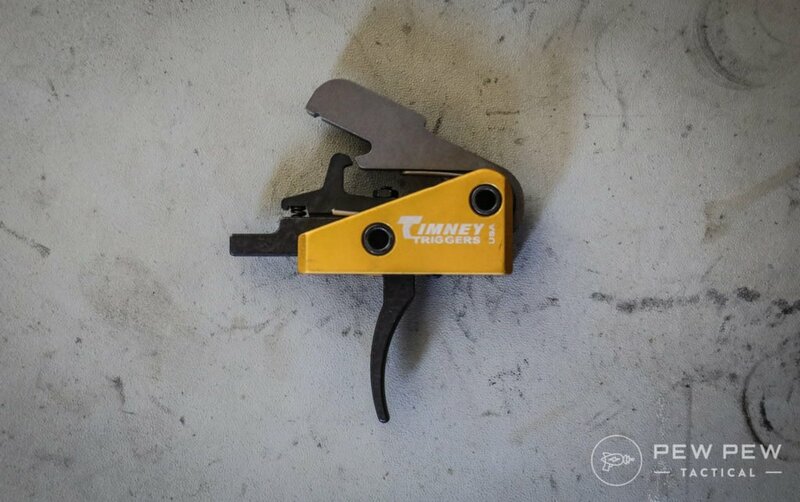 Founded in 1946, Timney has been making triggers for a very long time and for a huge range of rifles – from Mosin-Nagants to IWI Tavor, Winchesters to Tikkas, Timney makes it all. That level of experience and diversity is hard to match. Timney is also a true innovator in the market, another feature that you don’t commonly see in brands these days. 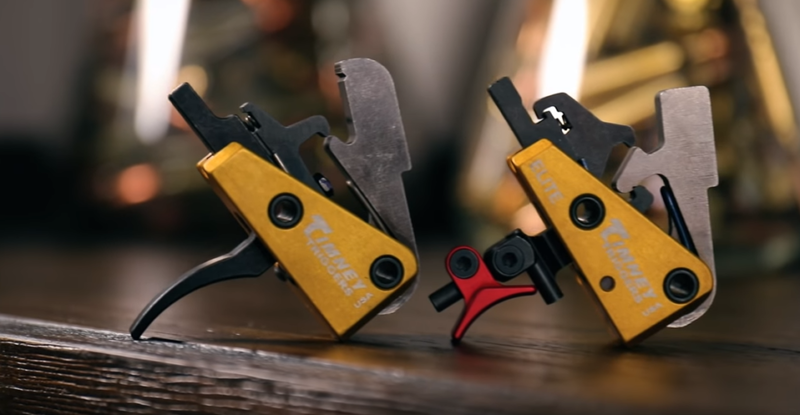 If you don’t want to settle for second best, Timney makes a trigger you need to consider. 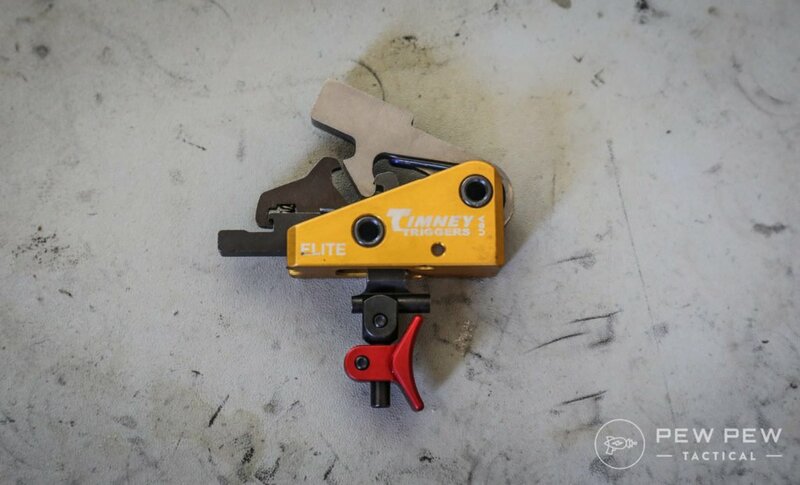 If you “just” want an upgrade trigger, Timney Competition fits the bill. Available in 3, 4, and 4.5 lb pulls the Competition is a fixed weight drop-in trigger pack that is as simple and straightforward as you can get. Single-stage and crisp, this is a game changer after working with a milspec trigger. Nearly zero pre-travel, clean break, and minor post-travel – the Competition lives up to your expectations. On the clock, the Competition shot a 5 shot split time of 0.128 seconds (for context, a Milspec trigger we shot did the same test with 0.22 second split times). Installing is also made super easy with its drop-in design and the fact that Timney gives you the tool needed to avoid the springs and tighten the set screws. There isn’t a lot of frills to this trigger, but that is part of the allure. It just does what needs to be done – simple. If a basic upgrade isn’t for you, then the Calvin Elite might be what you need. Given a free hand to design his dream trigger – the Calvin Elite is the product of Timney’s lead trigger designer to produce his personal ultimate design. Because of that, this is very possibly the perfect trigger for a “Buy once, cry once” approach and offers a level of customization that simply isn’t seen with any other AR-15 trigger on the market. The pull weight is advertised at 1 lb 8oz, ours tested at 1lb 9oz – this means it is literally a hair trigger, keep that in mind when using it! While we would never recommend this for a duty trigger due to the pull weight, it is an outstanding trigger for competition use! Average split times of 0.135 seconds on the range and a hyper-fast 0.115 seconds using UTM Blank Ammo. What really sets this trigger apart though is the number of customization options you’re given. From the trigger shoe coming in 3 options (flat, curved, and flat with a toe) to being able to set the shoe height, angle cant, and where the trigger sits horizontally in your trigger guard – the Calvin Elite provides options to allow you to make this truly into your trigger. However, that all does come with a cost (and not just to your wallet!). All of these adjustments are done with screws that need to be tightened down to a proper torque and should be set in place with some Loctite or you run the risk of them walking out during firing. 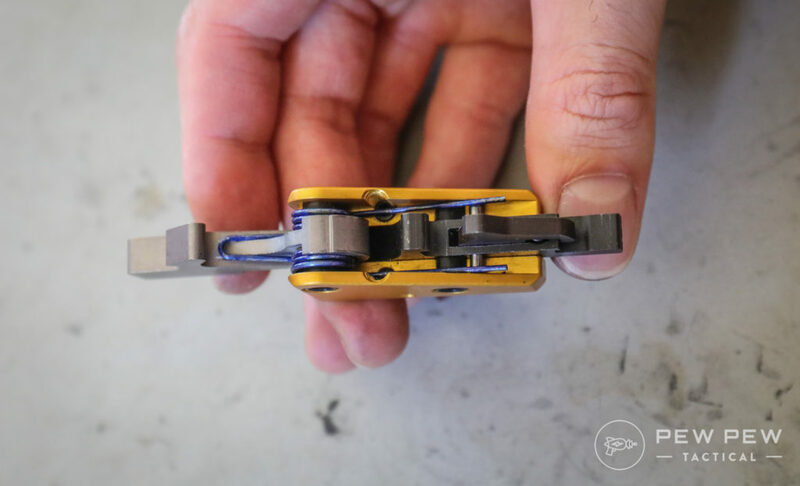 Fun fact though, if you do over-torque your screws and ruin them – as we did – the “Trigger Jedi” over at Timney are super helpful and sorting out any issues you might have (or cause). Outstanding customer service is always a huge plus in our book! Both of these triggers have been installed and reinstalled in multiple firearms and used for a host of testing and competitions – zero issues have arisen, except for when using the Competition trigger in a Pistol Caliber Carbine. Due to the brutal nature of a PCC’s straight blow-back design, the abuse suffered by the trigger broke a screw after about 1,000 rounds. It should be noted though that the Competition isn’t rated for PCC use – but Timney does make a dedicated PCC trigger that is designed for the extra force. AR-15s are only as good as the parts you put in them and a great trigger is the soul to any firearm. Timney Calvin Elite or Competition are great options for anyone looking to bring their AR-15 into a new level and especially perfect for anyone looking to get into 3- or 2-gun matches. If we had to pick just one – it would be the Calvin Elite. 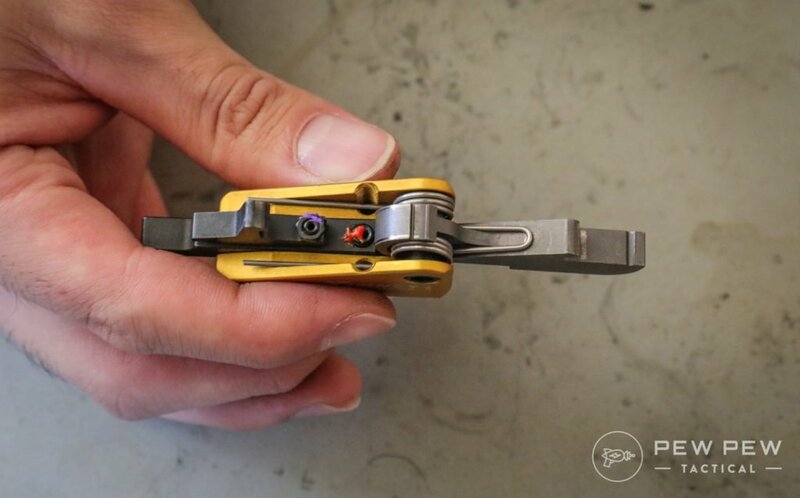 It functions amazingly, it looks awesome, and the customization options it brings makes it literally perfect for any user at just the turn of a screw. Do you have a Timney trigger? Upgraded your rifle with another trigger? Ready to go to the next step with your rifle? You’ll need an optic…take a look at the Best AR-15 Scopes & Optics to find yours! Thanks Andrew, this review is on Timney. We go over Geissele briefly in the roundup article.